Restoration Hardware without the rest is just hard ware and I was worn out. Four days home to sleep, play and feel human again; the perks of having a grown up job which sometimes takes more than it gives. When it’s bad, waking up in the cold and dark on a Wednesday morning, knowing a gauntlet of meetings awaits, I think of ways to die. Then I have coffee. A devotion is sometimes all the breakfast I eat till the morning meetings are through and there’s a long enough pause from facing an audience to swallow a few bites of yogurt. Each day is sprinkled with good, like hope for humanity and the possibility of effecting meaningful change, which is why I’ve kept at it for 15 years. To be in human service is a privilege but the pace can be overwhelming. I love people, which is easiest when we’re free from the burden of expectations. This morning while taking notes on church I re-read something I’d written a while ago: Stop trying to fix eternal problems. It was a well timed reminder and one I’ll try not to forget tomorrow. Taking time is a luxury I’ve only recently been able to afford and something I’m grateful for. The years getting here were spent climbing towards time and space. I wish humane society weren’t limited to stray cats and dogs and at the same time notice how each of us are entrusted with a set of challenges to work through. If I’m not hungry, angry, lonely or tired what’s left is appreciation, compassion, contentment and joy. When the day is allowed to unfold, thoughts have time to germinate, be watered and sprout. Life takes on a fertile feeling of substance and value; none of which could be possible if someone had just stuffed cut flowers in my hands. I love flowers. Who doesn’t? But, there’s an irreplaceable satisfaction in tending our own soil; it’s a right I wouldn’t want to steal from anyone. Help offered in fear or correction can quickly become enabling. If we can find a way to love what is without trying to change it, power, dignity and efficacy seem to almost restore themselves. Trust the process was a mantra at school. Lesley was ahead of its time, pioneering the field expressive therapy. Feeling perpetually out of place I welcomed these words as a way to push out chronic thoughts of comparison, failure and inadequacy. My mantra had been you’ll never be good enough. Trust the process was the medicine. It taught me to let go of attachment to outcome with everything, not just art. Poverty showed me there wasn’t enough so I’d better make some productive use of every precious resource which made art and living, terrifying. As part of being a student I was given access to gorgeous supplies; thick, cold pressed papers, the acrylic paint tubes that cost more than $7 each and fresh boxes of oil sticks with the words: ‘professional quality’ on them. I’m not pro bro. I’m not good enough to even touch these fine things. In the first studio class, after a whole year of just theory, we were invited to make marks using soft willow sticks on massive sheets of thin skinned brown paper. The instructor would treat us to different music each class and the whole time all we were allowed to do was make marks. Once I got past the guilt of wasting time, paper, charcoal and oxygen, it was liberating. Everything stuck in the rusted paths of my head got loose. Creative juice is a real thing. I’d felt it before but, like everything else, tried to save it in case it would run out. For whatever reason, like all the other serendipitous miracles of change, this was a permanent shift. Limitations lifted from other places too. When something was stuck or I found myself fighting old tapes I’d remember the words trust the process. It tells ego to sit down making room for God to show up. There’s always the ache for more because we’re living beings who never stop growing. There’s an ache to make, offer and connect because those needs are built into our design; no need to judge or defend. My ache was hungry so I fed it. 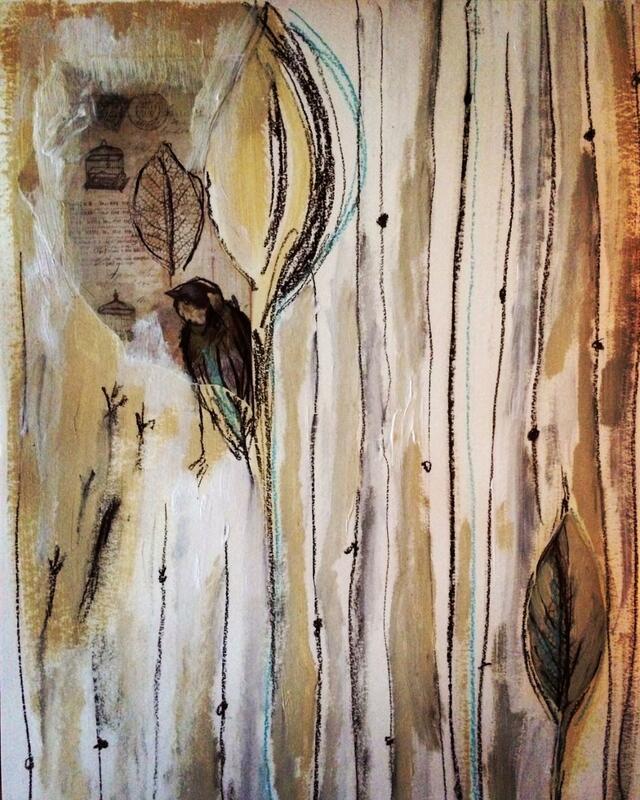 Heal: India ink, pen, oil pastel and chalk. Sometimes when I meditate I see 8 billion strings moving towards a far off light. Each person is a tiny circle along the strings. The image gives me peace as it suggests everything is unfolding in it’s own right time and all I need to do is keep choosing love and sliding along my string. Birds, eggs, feathers, fish and flower buds are symbols that have shown up in my art for as long as I can remember. They make comforting messengers. I was talking with a friend while painting this. She was telling me about the film version of The Glass Castle and how the ending message wasn’t sitting right with her. I haven’t seen the film yet but I’ve read the book and thought it was brilliant. Jeanette Walls’ story was the first relatable but beautiful description of poverty and resilience I’d ever read. Rather than condemning her parents, shaming her family or society, she claims unfiltered ownership with depth and compassion for her reality. While painting and listening to my friend grapple with her hopes for a kinder world I kept thinking: stop trying to fix eternal problems. And I laughed. Not because I’m glad the world is broken but because I’ve seen how pain has become a gift in my life. I believe it’s all, eventually, good. This composition shows up every now and then. Eggs, feathers, figures; the possibilities of ideas and abilities within each of us. The possibilities I’m hoping to hatch within myself and also things still hiding or needing protection. There was a feather in the highest egg but we were fighting so now it looks like the shadow of a wing or a dove. Either way, I just kept saying yes. And finally, this mama-jam. It’s a piece that’s been waiting to get born for weeks. The cut outs mocked me from the work table. My husband said she looks like she’s floating in a cereal bowl with milk. She is not. It’s a Jimmy Choo-bird laying a Kate Moss egg in a cage which may or may not have bars and it’s all about anorexia, consumerism, trauma, healing, the life-death-life cycle and whatever else. You’re welcome to weigh in. There’s also a fish. I love it. This is reassuring! There are still a lot of areas in my life that lack, lots! I’ve had tough moments recently. I’ll remember the mantra. For myself, I find low income liberating. Maybe it’s because there’s less to keep track of? I’m grateful. I love your paintings! Does art help you? I write some and find that if I keep at it for long enough, it tears holes in me. Poverty does offer gifts; we are the original minimalists. I’m grateful too. Glad to hear you like my art. It has always been a source of comfort; writing, painting, music. I think it tears holes in us so the light can get in. The artworks are astonishing. I can’t find the fish in the last one. I’m poor myself and most of the time don’t mind it. It’s quite radical – to not try and fix eternal problems. I think there’s a relation to the Kate Moss egg in Bazaar Obsession and the feather that got painted out in Incubating. All artists have their symbols. Birds show up in mine fairly often, whether I intend it or not. I haven’t thought about it too much, not wanting to burden the idea with baggage. Setting the ego aside – when one gets lucky enough to recognise the difference between ego and soul/spirit one has the chance to let ego rather serve the divine than rule for its own sake. The work continues! Thanks for sharing Petrujviljoen (do you have a preferred name or nickname?) Glad to hear you don’t mind the less is more of being poor, though I do wish it were more accessible for all people to meet our basic needs without having to struggle. You’re probably right about the feather, good catch. Joseph Campbell wrote a book called Man and His Symbols in which he says there are certain symbols that are universal across cultures and time. I’m guessing our birds are among them. Also such a good reminder to learn the difference between ego and soul. I know I forget sometimes. How can you tell the difference? To lifelong learning. Call me Petru. It’s my first name. If wishes were money we’d change the world. The ones who have the money – suppose one doesn’t need to go there. Haha! Yes! To wishes, Petru. All the wishes. By the way: two links for writing competitions. There’s a bit of prize money involved. I’m bashing away at the keyboard as we speak. The flash fiction is a 300-word story and the novella I’m not sure. I’d love to play! I’ll take a peek but sadly no keyboard bashing for me today. Back at the other desk, haha. Good luck with your story! I’ve never heard anyone describe my fear of art and creativity the way you did here…waste of time, waste of resources….these resources shouldn’t be wasted on someone who isn’t a professional. if it isn’t professional it is meaningless. Don’t create something unless it’s going to be good enough and worth it. Oh my dear cousin, though we don’t know each other in the sense of spending time together, it seems we know each other very well. I understand your mind so much when you write. You are not alone.